Blurb: If Germany is the place to be for developing youth, then FC Schalke 04 is at the head of the pack. But there is a little of an Ajax feel to the Gelsenkirchen-based outfit. While they can – and do – produce their own players, Schalke’s bread and butter, much like the Dutch giants in their current form, is the purchase of young players to put the finishing touches on their development right before they’re ready for the first-team, or right after they’ve broken into it. The likes of Max Meyer, Leon Goretzka, Thilo Kehrer, Weston McKennie, and even the one heralded Lewis Holtby all joined Die Königsblauen with 2-3 years left in their education period, or a year after they reached first-team football at their former club. There’s no disrespect in this operation; it works. As Schalke look to re-establish themselves domestically on the back of this approach, there’s one other young player who they can hopefully call upon moving forward to aid them in their quest; Breel Embolo. Analysis: Though a full Swiss international, Breel Donald Embolo is Cameroonian by birth, born in the capital of Yaoundé in 1997. After moving to Basel at a young age, he began his footballing education with FC Nordstern Basel at the age of nine where he would spend two years before moving to Basier Sportclub Old Boys (BSC Old Boys) in 2008. An additional two years with BSC would then net him the prized move to FC Basel 1893, where the final four years of his development would take place. He would go on to make his full debut for the Swiss giants at the age of 17 in the latter stages of the 2013-14 campaign. Touted as one of the brightest young players in Europe, Embolo, now a full international after coming through the Swiss youth ranks, moved to Schalke in 2016, but a pair of serious injuries (fracture of the fibula, and an ankle fracture) limited the big forward to just ten appearances (seven in the Bundesliga) in his inaugural season. Now fit, and under a new commanding officer in the form of young Domenico Tedesco, the versatile youngster still has it all to do to prove his worth. Once quoted as being “powerful, technically strong and decisive. He has explosive pace and is a composed finisher” by UEFA.com writer Steffen Potter, Embolo certainly has all the tools to excel at the highest level. Former Swiss international and Basel teammate Fabian Frei also sung his praises, saying “I think he is a sensation – playing like that aged 17. I like him as a person as much as I do as a player. His feet will stay on the ground – he won’t be shooting from 50 metres to score the goal of the season. You can give him good advice and he is ready to take it without getting angry.” Blessed with pace for someone his size, strength on the ball and intelligence off it, Embolo is a nice blend of power and ability, pace and physicality, and is flexible in terms of how you can deploy him. Looking Ahead: Though Schalke may be an ideal place for a young player with bags of potential, take your chances when they are presented are equally as important. At current, Guido Burgstaller has cemented himself as first-choice center forward. Additionally, Yevhen Konoplyanka, Daniel Caligiuri, and young upstart Amine Harit have impressed on the flanks, keeping the likes of Embolo and Alessandro Schopf out of the XI regularly. One factor that does work in his favor, is time. Burgstaller, Caligiuri, Konoplyanka, Franco Di Santo are all pushing thirty, while Embolo is still just twenty. It may not be his time currently, but if he continues to keep his feet on the ground and learn from those around him who are more experienced, Embolo will certainly have his time in the sun. Blurb: A talented North Korean forward from the relative unknown, Han has quickly announced himself in Italy and it will not be long before his reputation expands outside the country either. The 19-year-old attacker joined Cagliari in March 2017 and having netted during their 3-2 defeat against Torino the following month, he has since surprisingly only featured from the substitutes bench on three brief occasions. A season-long loan deal made sense and he’s playing first-team football on a weekly basis for Perugia, who thanks to him harbour hopes of making a promotion push to Serie A this season. Analysis: Having only turned 19 in September, Han Kwang-Song is still being tried and tested in a number of different attack-minded positions – to good effect. In a centre forward role he scored a hat-trick against Virtus Entella and grabbed one more against Pescara to start the new campaign in style, before playing predominantly on the wings to suit their 4-3-3 formation. Perugia’s excellent start to the season was ruthlessly extinguished after five straight defeats, though they have started to creep back up the league standings and are only nine points off the leading pack of Parma, Bari and Palermo. Han is capable of using both feet and as a result, has played across the forward line while Samuel Di Carmine regularly spearheads their attacks. Not only is he able to create chances with his quick feet and sharp turns within an instant, he’s equally able to finish them too – often showing good anticipation and managing to sense dangerous opportunities before they arise, getting into promising positions to help link play in the final third. Looking Ahead: Han has already shown his quality on a number of occasions but the next test for him will be to maintain his current performance levels with consistency throughout a strenuous league campaign. It only gets harder from here in his career and it’s almost guaranteed that Cagliari will utilise him more often next term, in a tougher competition with stronger defenders and better quality all-round. Many critics will sniff at his success thus far, suggesting Serie B football just is not good enough to justify such hype and expectation, but his determination to improve and eagerness to silence these critics will be tested in due course. 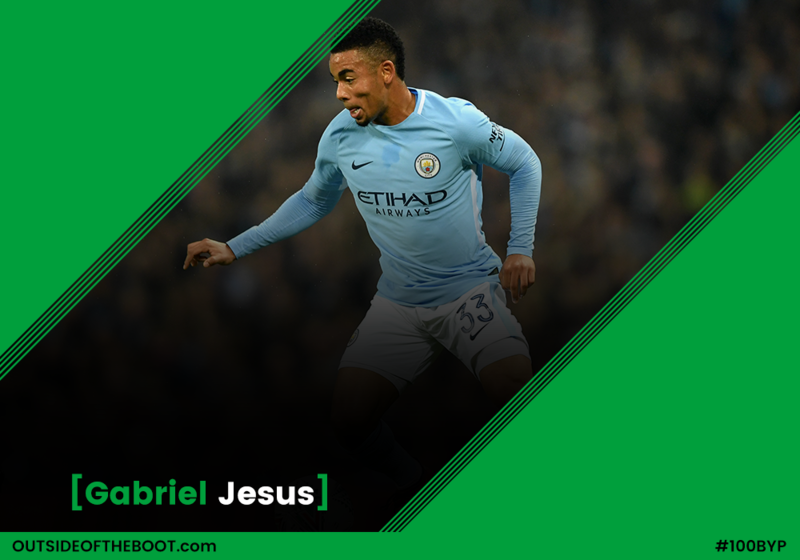 Blurb: Jesus arrived at Manchester City with a lot of hype from a remarkably high price tag and a successful Olympic campaign. However, he has lived to the expectation. Although injuries limited him to 10 appearances in the second half of the past season, he has done enough to establish himself as No. 1 on City’s depth-chart. He has adapted quickly in England, having scored an impressive 15 goals out of 20 matches in the top flight. Sergio Aguero has been the undisputed starter since the beginning of the City’s resurgence, but Jesus has proven to be the Argentinan’s toughest opponent to compete for the starting job. Analysis: Run, run and run. Jesus’s incredible work rate catches Guardiola’s eyes, who by no less than one occasion declares his impress to the Brazilian’s biggest strength. However, Gabriel doesn’t run as if he were Forrest Gump. Making blind side run, investigating space and closing spaces are the way the Brazilian terrorize the opposing defenders. More importantly, Jesus doesn’t get caught offside often though he operates in the borderline area. His lack of physical ability was a concern when he arrived at England, but his acceleration and balance made him a dangerous weapon on the ground. He is also a versatile player who can play in both wings, using his pace and his offensive awareness to initiate chances. Looking Ahead: Having Pep Guardiola coaching him is probably the best opportunity Jesus will get on his playing career. Although he has made the name of himself as one of the more premier goalscorer in the league, he is still a raw talent who needs more experience. His impressive record is complimented by City’s outstanding midfield, but he needs to improve on creating chances for himself. At times when City is unable to break the opposing defense, his impact becomes minimal. Also, his inexperience, probably from his days playing street football, leads to his ill-advised tendency of chasing the 10-90 ball. He commits a lot of fouls and suffers injuries as a result. With proper drills on the training ground to improve his ability with the ball is on his feet and his awareness, Jesus can be one of the best striker in Europe. Blurb: We have seen renowned players like Kaká, Robinho, Sneijder and Robben succumb to the careers guillotine called Real Madrid. And none of them was called to the slaughter by the age of 16. Now it is time to Vinícius Junior show why Los Blancos spent so much on him, labeling the boy as the most expensive player born this century. And judging his recent development in Flamengo it’s fair to say the Spanish side made a clever move. Analysis: Vinícius was already on the sight of many European giants before the U17 South American Championship, but this was the moment he assured his potential for the whole world. And it’s pretty simple to understand why. On one single competition he played on all offensive positions available on Brazil’s 4-2-3-1 and did not disappoint anywhere – however he clearly feels better playing wide open on the left wing. He was elected the best player and also grabbed the top scorer award, with seven goals. In Flamengo his development on trainings is pretty amazing and the reports sent to Real Madrid showed Vinícius was the best player at whole squad on the aerobic tests. The boy is not just a useless dribbler, at 17 years old he already has a physical structure that allows him to battle with burly and fast defenders. His path is quite different from the lives of teenagers in the UK his age. In fact, it’s much more common to be looking for moped insurance for 17 year olds than looking for a contract at the most successful side in European Football. It is quite impressive how Vinícius is also improving on his tactical skills, participating actively on the tentative to recover the ball, and on his movements without the ball. Dribbles timing are a little concern, but he had to have a weak point, right? Looking Ahead: Flamengo has a congestion of players able to play at Vinícius position, but however he does not have so many minutes, he makes them worth, making himself the perfect choice for a tough second half. Even more if his team is trying to hold itself on the defense to perform counter-attacks. As Júnior is already sold to Madrid, the keyword must be patience. Patience for him, to not rush his improvements, patience for Flamengo supporters, which has to remember his age at delicate situations and patience for Madrid, to not expect a new Cristiano Ronaldo too soon. But with right amount of pressure and expectations Vinícius success is just a matter of time. 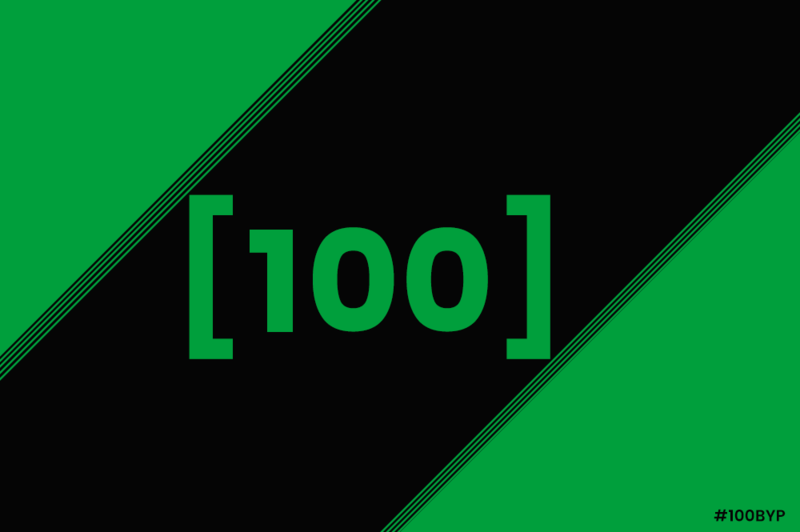 Blurb: Despite being a remote island nation of little over 300,000 people, Iceland never fails to produce talented youngsters, and Óttar Magnús Karlsson can certainly be added to that impressive list. A former Ajax youth team player who has already featured three times for the senior national team, Karlsson is a fantastically gifted forward who looks equally comfortable across the front line. After dazzling for Víkingur in 2016, the 20-year-old is now continuing his development in Norway with Molde, where he has showcased on several occasions just how talented he is. Analysis: Standing at six feet and three inches, Karlsson certainly looks like your archetypal centre-forward. However, despite being an imposing figure that always makes a nuisance of himself inside the oppositions’ penalty area, he also boasts a surprisingly deft touch and impressive vision. When operating as an out-and-out striker – as he did for most of the season he spent at Víkingur – Karlsson has a tendency to drop deep to pick up the ball in pockets of space before spraying quick passes out wide. His time at Ajax and Víkingur has resulted in him looking particularly comfortable playing in the middle of a three-man front line, but he is also able to operate as a lone striker or as part of a pair, as has been the case since joining Molde before the start of this season. The extent of Karlsson’s talent was showcased at the end of the 2016 campaign, when he was named as that year’s most promising player in the Úrvalsdeild after scoring seven goals in 19 league appearances, and he remains very highly thought of in his home country. Looking Ahead: Despite managing to score his first goal in Norway on only his second start, it hasn’t been entirely plain-sailing for Karlsson since joining Molde. A lack of game time during the first half of the season resulted in the youngster returning to Iceland for a two-month “vacation” in the summer, and he hasn’t featured for the club since the middle of June. However, he has continued to play an important role for the Iceland U21 side (for whom he scored his first goal in November) whilst also earning three caps for the senior squad, so 2018 looks as if it’s going to be the year in which he pushes for a more prominent role at club level. A loan deal is also on the cards, and could benefit the 20-year-old, but he has indicated on several occasions his desire to stay and fight for a place at Molde. 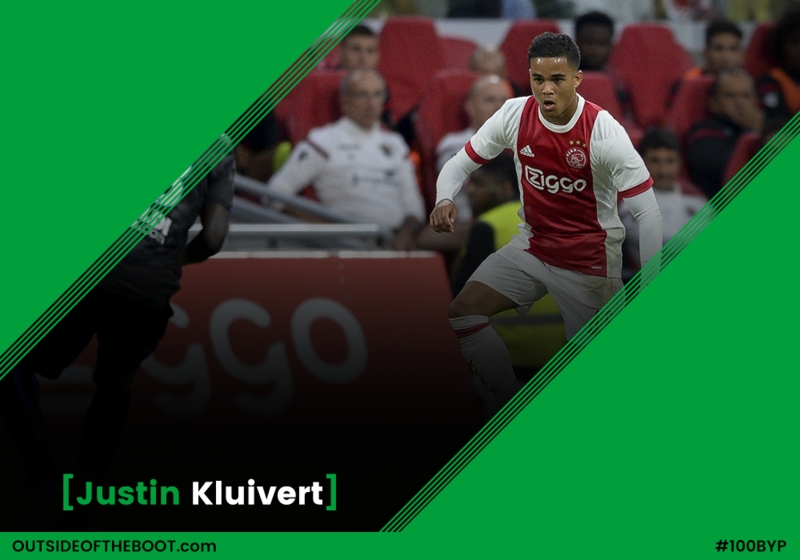 Blurb: Justin Kluivert burst onto the scene last season, clocking up 20 appearances, two goals and five assists in the Eredivisie and Europa League for Ajax. However, the 18 year old has a fight on his hands if he is to make a spot in Ajax’s front three his own, due to direct competition with David Neres on the right and Amin Younes on the left. Kluivert will need patience at times, as he’s been left on the bench on occasion this season, but he undoubtedly has the talent to become an important player for Ajax in the coming seasons. Analysis: The winger is brilliant with the ball at his feet. His dribbling and close control allow him to cut through defences with ease at times and ensure that he is able to keep possession and maintain a constant threat. He showed this recently when he assisted the first of Donny Van de Beek’s goals against NAC Breda by getting down the left wing before firing the ball across goal to be tapped in. He is also tireless in his work and does not shy away from his duties to help the team defensively when needed. One thing that Justin Kluivert will be looking to improve on is consistently producing a quality end product to his incisive runs. He didn’t score in his first five starts of the season, although he recently scored an incredible hat trick against Roda JC, which highlighted just how good he can be. He has also shown his quality on the international stage; he made his debut for Netherlands Under 21s in October, going on to get two goals in three games. If he is able to consistently produce his best in the final third, he could become one of the best wingers in Europe. Looking Ahead: Justin Kluivert has shown what he can do plenty of times in the youth ranks for both club and country, as well as showing glimpses for the first team the challenge for him now is to do it consistently on the bgi stages. There have been incredible moments for him already, such as his assist for Davy Klaassen in Ajax’s Europa League triumph against Schalke and he must now work to cement his place in the Ajax first team and replicate those performances on a regular basis. Kluivert has expressed a long term aim of earning a move to Barcelona, as his father once did. He has the skill to go that far and the incredible talent that has left Ajax in recent years show he is at the perfect place to develop it. Straight out of Lech Poznan’s academy, Kownacki made his professional debut at the same club being a 16-year old. The next season he won his first Polish league title at the age of 17, having played 38 games and scoring 7 goals. His definitive affirmation came with 32 matches and 11 goals in the 2016/2017 season (19 years old), which led to a big transfer to Sampdoria (where in seven matches he has scored five goals) as well as to a presence in his u-21 national team, having scored five goals in four Euro u-21 qualification matches (20 years old). Truly an impressive résumé. Analysis: Being a promising polish striker, the comparisons with Robert Lewandowski did not take much to arise. However, we are facing here, in my opinion, two very different styles of play, as I try to explain below. The closest characteristic between the two them must be their finishing, and Kownacki shows great skill in that aspect, with a potent, foot-indifferent and seemingly easy striking game. He also shows a very decent heading game and a tendency not to exaggerate in his passing or dribbling (although he has the skill to do so), being a very practical player. But the similarities end there. Dawid is not by definition an area striker, being instead a mobile forward who is keen to explore the vicinities of the said zone of the pitch. He has outstanding pace and ball control, showing a proneness to use them by picking the ball in more deeper zones and taking it to the area whether by combinations with his teammates or by himself. His physical structure favours his style of play (he is not excessively tall, standing at 1,85m). He just needs to improve his composure in order to be as effective as he normally is against faster and more aggressive defenders, something he is now experiencing in Serie A. Looking Ahead: Kownacki has yet to affirm himself in Sampdoria, having thus far played more in the Italian Cup (3 goals in to matches) than in Serie A (although with two goals in 87 minutes, he has a 43,5 minutes per goal average to presente). The logical and natural step for him is to be patient and learn his craft in these more demanding circumstances he is now facing, improving his tactical wisdom and composure. Perhaps after a season of adaptation, he could become a player worthy of furthering the Polish striker heritage, with the due (and important!) differences apart. The national team and domestic stardom is within reach to Dawid Kownacki. 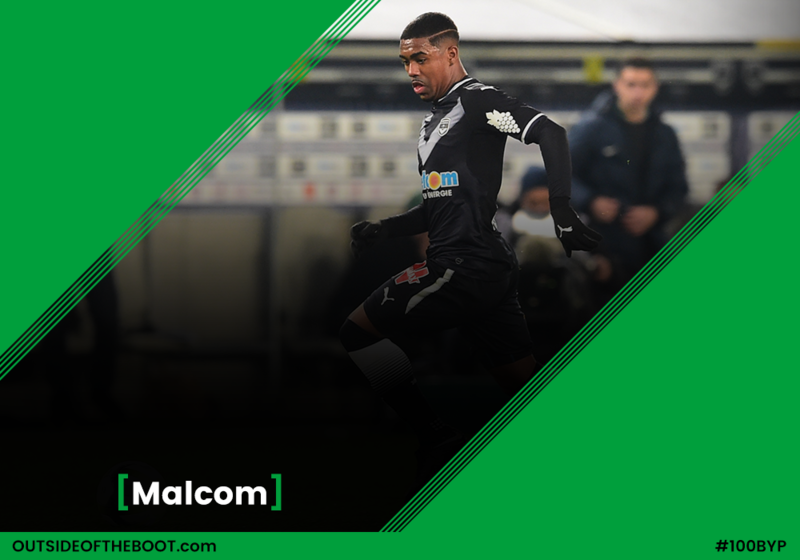 Blurb: A name known to many in the French game over the past few years, Malcom has finally exploded into the talent many thought he’d be a little earlier. In a Bordeaux side that can lack quality at times, he is their real star already and has every club in Europe keeping one eye on his progress. Analysis: Often found on the right-wing, Malcom is very much a modern wide man that loves cutting inside and striking at goal. He’s already hit seven this campaign, including absolute belters against Lyon and Dijon that he had no right to smash into the back of the net. If you leave him the space, he will punish you. Defenders are getting a little wiser to it but the explosiveness he possesses allows him to take a chance anywhere within 30 yards of the goal. Add to that a quickness, a directness about his play and trickery to boot, he’s a tough customer for any defence to come up against. When he’s on his game, the Brazilian can be almost impossible to stop and because of that, Bordeaux are starting to dance to the rhythm of his drum. That responsibility has not weighed heavily on him though, in fact it almost looks like Malcom relishes being in that spotlight. He’s shown great passion, encouraging others to follow his lead on the pitch and that is mightily impressive to see from someone who only turned 20 in February. Looking Ahead: The 20-year-old can be just about what he wants to be. Does he want to be at a top European club? Does he want to be a Brazilian international? All of that is in front of him if he carries on at his current trajectory. A little work on his consistency and being more unselfish will go a long way, as both have gotten in the way at Les Girondins over the past few months. When a move likely comes in the summer, he’ll be wise to choose somewhere the burden isn’t so great to be the man and where he can flourish as part of a team. Blurb: Boasting a lofty reputation for exploits in youth football, 2017 was the year that Martinez justified the hype at senior level. A stellar showing at the U20 Sudamericano, in which he almost single-handedly dragged Argentina to the U20 World Cup, was followed by an explosive debut campaign for Racing. Nine goals in 29 appearances later and Martinez had quickly established himself as one of the hottest properties in Argentinian football. Now back from a metatarsal injury and already back amongst the goals, Martinez has all the hallmarks of the next great Argentinian number nine. Analysis: For a 20-year-old, Martinez is already an extremely well-rounded striker. A clinical finisher both inside and outside the box, he rarely needs more than a couple of touches before getting a shot on target. Combine that with his fantastic movement, excellent concentration levels and rapid speed of thought and it all combines to make an absolutely lethal hitman. Far from being a mere poacher, Martinez also contributes to the build-up too and earned the nickname of El Toro for his mix of pace and power. A tricky dribbler, with impressive upper body strength and a surprisingly good heading ability, Martinez really does have it all and has earned comparisons with the likes of Radamel Falcao. A model professional off the pitch and fiercely competitive on it, Martinez also has that feisty, snide side to him that can occasionally boil over. When channelled correctly, that aggression is a phenomenal asset, especially when it comes to pressing from the front, but is one area that could potentially use some honing. Looking Ahead: If 2017 was a breakthrough year for Martinez, then 2018 should consolidate his place as one of the hottest young strikers in world football. Despite his commitment to win titles with Racing, the smart money is on a move to Europe at some point next year. Borussia Dortmund sent scouts to see him score a fantastic goal against Boca that helped end the champions 100% start to the season, while Atletico Madrid have been heavily linked in the past and everyone from Monaco and Inter to Manchester United and Arsenal are rumoured to be keen. A surprisingly low buy-out clause in the region of €9-12mil represents fantastic value for money despite his relative inexperience and there is even fanciful talk of him sneaking a place on Jorge Sampaoli’s World Cup squad. Whoever manages to land him will be very lucky indeed. Blurb: At first, only a few French & youth football enthusiasts had heard of him; then Ligue 1 supporters watched him week in and week out as he rose to French football prominence – most dismissed him as just another young talent from France’s domestic game. But in 2017, the world had taken notice of Kylian Mbappé. Analysis: Mbappé is the the modern day definition of an attacking threat. With the ability to play from wider positions but also have the clinical attributes to play through the centre, Mbappe represents the new age of ‘forwards’ that are no more just your traditional number nines. With immense ball control and a quick turn of pace, Mbappé is a nightmare for defenders – he has shown to be lethal against both front foot defenders and those who are more pragmatic when faced up against the 18-year-old. His willingness to take on defenders outside the box makes him an ideal option for the wider areas, but he is well suited for a more central role too. Particularly when faced up against tighter defences, which his club side Paris Saint-Germain usually are, Mbappé has the ability to work his way past the tight spaces whilst also find a finishing touch in crucial moments. His pace on the ball is immense when the team has more abundant spaces to play into, which highlights his diversity in attacking situations. A young attacker comfortable on the ball would prefer a defender more closer whilst becoming easier to defend against when afforded space – Mbappé is lethal from both situations. The Frenchman has thirty-eight goals and fifteen assists in the 2017 calendar year (at the time of writing), it’s hard to envisage what heights he can hit when he’s at his peak, having already proved himself at the highest level for two different clubs. Looking Ahead: No one would have imagined what Kylian Mbappé had created in 2017. With a dream rise to prominence Mbappé has already achieved what most successful players only reach seven to ten years from where he is now. But with a World Cup in the year and potential to challenge World football’s dominance with Messi & Ronaldo’s eventual demise, Mbappé cannot be ignored.